Plant-parasitic nematodes are important pests of many cultivated plants. Vegetable crops account for the greatest proportion of nematicide use because of infection by root-knot nematodes (Meloidogyne spp.). However, the negative impact of most chemical nematicides on the environment has led to a total ban or restricted use of these chemicals. 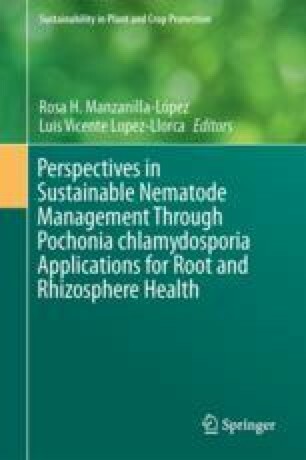 The research discussed in this chapter concerns the development, innovation and good manufacturing practices of selected native isolates of Pochonia chlamydosporia as potential microbial control agents for the management of root-knot and false root-knot nematodes (Nacobbus aberrans sensu lato), as part of research conducted by multidisciplinary groups in Brazil (Federal University of Viçosa), Cuba (CENSA, Mayabeque) and Mexico (Colegio de Posgraduados-Montecillo). The studies referred to in this chapter deal with the basic approach towards implementation of a bio-management strategy for specific agro-economic production systems in Brazil, Cuba and Mexico. In memoriam of Brian R. Kerry. We would not arrive here without his guidance, his motivation and commitment to the science of microbial control of nematodes, and in particular to Pochonia. His memory keep us motivated to achieve bigger challenges. We also would like to acknowledge colleagues, especially all graduate and undergraduate students, who have accompanied us on this long but fascinating journey. Dallemole-Giaretta, R., Freitas, L. G., & Lopes, E. A., et al. (2015). Pochonia chlamydosporia promotes the growth of tomato and lettuce plants. Acta Scientiarum. Agronomy. no.4 Maringá Oct./Dec. 2015. https://doi.org/10.4025/actasciagron.v37i4.25042 . Accessed 3 Oct 2016. Sellitto, V. M., Curto, G., & DallaValle, E. et al. (2016). Effect of Pochonia chlamydosporia-based formulations and the regulation of root-knot nematodes and plant growth response. Frontiers in Life Sciences. http://www.dx.doi.org/10.1080/21553769.2016.11193827. Accessed 20 Oct 2016.